When we say exercise, many people imagine working out in a gym or on a treadmill or lifting weights. But for kids, exercise is different. Kids exercise when they have gym class at school, during recess, at dance class, while playing soccer, or while riding bikes. 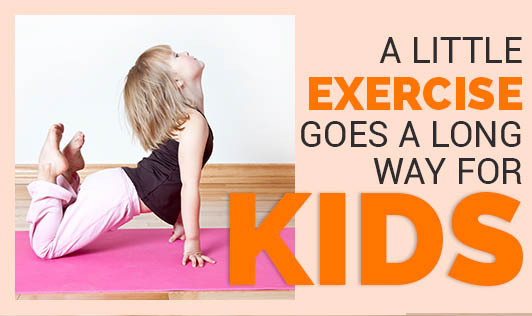 Kids who are physically active tend to have stronger muscles and bones, have leaner bodies (less body fat), and are at a lower risk of developing any metabolic syndromes like diabetes/cholesterol/heart problem. Apart from the health benefits, kids who exercise or are physically active sleep better and can handle physical and mental challenges better than kids who don’t get much exercise. Jump Rope: To make it more interesting, pick up a book on jump rope rhymes. Balloon Balls: There are various ways to play with balloons indoors. Jumping Jack: Simple, good for coordination, and heart health. When kids can't sleep, make them do 25 jumps to tire them out. Pillow Fight: It is pretty self explanatory. Freeze Dance: When music stops, instruct kids to freeze their pose and hold it until music starts to play again. Tickle Tag: Chase your children and when you catch them, it's tickle time! Animal Races: Hold races where they can imitate the hops, squats, and waddles of various animals and birds like bunnies, frogs, and ducks. Cycling: A daily bicycle ride is important for strengthening muscles. Swimming: It is a wholesome exercise and is good for all ages. Obstacle Course: Create a furniture course in your apartment or make a course outside. Help your kids participate in age-appropriate activities. Make a regular schedule for physical activity. Incorporate activity into daily routines, such as taking the stairs instead of the elevator. Follow a healthier lifestyle yourself, so you'll be a positive role model for your child. Keep it fun, so you can count on your kids to come back for more.